What differentiates an LCL Forwarder from the Post Office is that they will normally only accept 20 cartons or more. If you have just one or two heavy objects, they probably will show no interest to accept it. Then you need utilize Postal Sea Freight. Container shipment rates vary, much like the commodities market. Forwarders reserve space on freightors in advance. If their space is not totally full, close to shipment time, prices might come down a bit. This is why rates can fluctuate within a weeks time of booking, unlike FedEx or Postal Rates. When you book space, we will confirm price the same day. Rates will soon be listed below in a separate table. 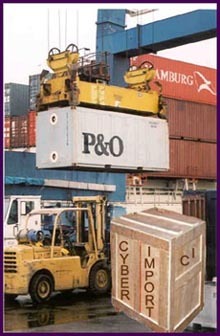 Containers, even LCL, must pass through your country customs port. This means that you will need the services of a broker at your end. They can answer all your questions about documentation, duty to be paid, and arrange for pickup or delivery.